This new research shows that the nervous system of an embryo is quite complex by the time most women find out they are pregnant. A study published in March 2017 reveals “adult-like” pattern of nerves established before the end of the first trimester. This new dose of science and technology should inform our fetal pain debate. 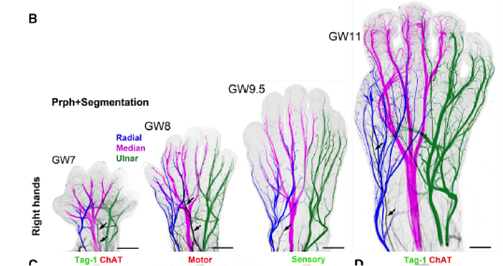 The second image shows the nerves on the right hand of embryos from 7-11 weeks gestation (5-9 weeks post-fertilization). Even at 7 weeks gestation, the development is quite advanced—even more so at 11 weeks. All of this is happening in the first trimester! We also know that there is no question, biologically speaking, about whether an unborn child can feel pain by 20 weeks post-fertilization at the very latest, since by then they have the full anatomy to process pain and also the neurobiology to transmit painful sensations to the brain and to perceive pain. Studies show that babies can feel pain by their increased hormonal stress response and by wincing when they are exposed to painful stimuli. It should come as no surprise that it is common practice for doctors to administer anesthesia before performing in-utero surgeries on preborn babies. When administered, anesthesia decreases the stress response in preborn babies when compared to their hormone levels when painful stimuli are applied without any anesthesia.Twenty states have already passed laws banning abortions after 18 or 20 weeks post-fertilization because of the capacity for unborn children to experience pain, with Iowa being the latest to pass such legislation. A few weeks ago, people gathered for the March for Science. If we are to be honest, science shows us the clear-cut reality and complexity of embryonic development in the earliest weeks of the first trimester. This is an inconvenient reality for those who rely on ideology instead of science to deny the humanity of preborn children and their capacity to feel pain. In our culture, there are those who will have more compassion for animals than for babies who are given a death sentence because of their age and location. We will continue to fight until every one of these vulnerable preborn babies are protected—by our laws and our culture. It is not enough to recognize that these children feel pain when aborted; we must empower those around us to make life-affirming choices. Only then will our nation become one where it is safe to be in the womb. About the guest blogger: Arina O. Grossu, M.A., M.S. 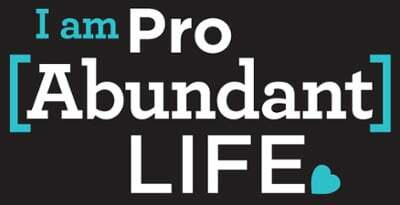 Bioethics, is the director for the Center for Human Dignity at the Family Research Council, where she focuses on sanctity of human life issues, ranging from conception to natural death.